Manu Braganca does not work for, consult, own shares in or receive funding from any company or organization that would benefit from this article, and has disclosed no relevant affiliations beyond their academic appointment. Seventy years after the death of Adolf Hitler, “Mein Kampf” is in the public domain and free to be republished. The history of its English version is relatively well-known, thanks to historians James and Patience Barnes. Its history in French is not. While French journalist Antoine Vitkine wrote a 2009 global history of “Mein Kampf” and two French lawyers and a historian recently shed light on the French-language editions of “Mein Kampf,” neither book has been translated into English. Beginning in 1934 – and into the 21st century – a tug-of-war over the French version of the text took place among an eccentric, right-wing publisher named Fernand Sorlot, Hitler’s lawyers, German censors, and the International League Against Racism and Anti-Semitism. With a much-anticipated critical edition of Hitler’s hateful screed in the pipeline, it’s worth revisiting how the French translation endured decades of dubious sales, editing and censorship. When Adolf Hitler became chancellor of Germany in 1933, people around the world were fascinated with the Nazi leader known for his fiery rhetoric. Many were curious to learn more about the man’s life and his true beliefs. An obvious entry point into Hitler’s mind and political agenda was “Mein Kampf,” first published in Germany in two editions, the first in 1925 and the second in 1926. Referred to as the “Nazi bible,” international publishing houses started translating it into different languages. 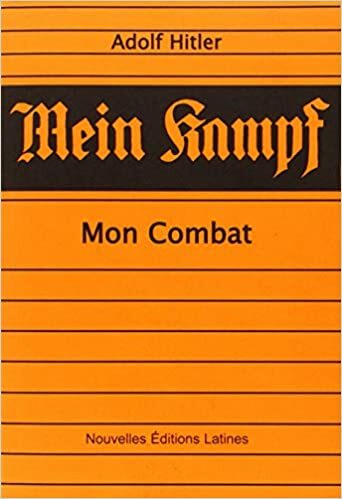 The first French edition of “Mein Kampf” – entitled “Mein Kampf: Mon Combat” (Mon Combat simply means “My Struggle” in French) – was published in 1934 by the Nouvelles Éditions Latines (New Latin Editions), a publishing house founded a few years earlier by Sorlot. Though Sorlot was sympathetic to anti-Semitism and fascism, he seemed motivated more by turning a profit than advancing any political agenda. Sorlot was also publishing the book illegally: He hadn’t even secured the rights to publish a French edition of Hitler’s tome. When Adolf Hitler caught wind of the French version, he and his publisher brought Sorlot to court, demanding that he cease publication. Hitler knew that Germany was not ready for war, and, on the international stage, he was doing his best to conceal his plans. In “Mein Kampf,” Hitler had called for the destruction of France, a country referred to, at various points, as the “irreconcilable mortal enemy,” “the most terrible enemy,” and “the mortal enemy of our nation.” The last thing he wanted was to tip his hand by having a translated copy circulating among the French. During his trial, Sorlot claimed that he was acting out of patriotism, that he wanted to warn the French public of the looming German threat. Even before the rise of Nazism, France was highly suspicious of its Eastern neighbor. In the late-19th century, following the Franco-Prussian war of 1870-71, Germany had annexed the French Alsace and Moselle, two border regions disputed by the two countries for centuries. World War I, of course, did nothing to ease the tensions between France and Germany. But, in 1934, Hitler had the law on his side, and Sorlot lost the trial, forcing him to withdraw the unauthorized French translation from the market. Whether it was out of patriotism or to earn a quick buck, Sorlot continued to covertly sell the translated version. When the first translation into English was published in the United States by Houghton Mifflin in 1933, it softened Hitler’s rhetoric and visions of expansion. Similarly, Hitler ensured that the French version was also significantly edited. The numerous anti-French passages that the original edition contained were toned down or cut altogether. Sorlot’s 1934 unabridged translation was 687 pages. Fayard’s 1938 edition, published under the much gentler title “Ma Doctrine” (“My Doctrine”), would only be 347 pages. In 1940, Hitler invaded Denmark, Norway, the Netherlands, Belgium, Luxembourg and France. In the wake of the invasion, the German authorities wanted to exploit the countries’ natural and industrial resources while also being able to devote as many troops to the front lines. The best way to do both was a mollified public, so they sought to blacklist any texts – “Mein Kampf” included – that could fuel existing anti-German feelings. In all occupied countries, the German authorities created “indexes” of prohibited books or authors. In France, since Sorlot’s original translation, two additional unauthorized translations of “Mein Kampf” had been published, as well as a few other book-length commentaries that quoted extensive excerpts from Hitler’s book. All were placed on the list of “books withdrawn from sale by the publishers or forbidden by the Germans,” often referred to as “Otto’s List” after Otto Abetz, the German ambassador to France during the war. After the war, Sorlot resumed publishing, which included printing and selling “Mein Kampf.” He initially did so discreetly, but with time, encouraged by the absence of backlash from the French authorities and the public, he started selling Hitler’s book more openly. This ended in 1978. The 1970s had seen a sharp rise in racism and anti-Semitism in France, and Holocaust deniers were becoming increasingly vocal. An 1881 French law against defamation and insults was reinforced in 1972 by an anti-racism law (known as “Pleven Law”), which criminalized racist insults and the incitement of racial hatred. For obvious reasons, “Mein Kampf” didn’t comply. The fact that Hitler’s book was still being sold by Sorlot’s Nouvelles Éditions Latines – by then considered a right-wing publishing house – garnered the attention of the Ligue Internationale Contre le Racisme et l’Antisémitisme (International League Against Racism and Anti-Semitism). By the late 1970s, Sorlot could hardly argue that he was selling a translation of “Mein Kampf” out of patriotism. This time, he played the “historical document” card. It didn’t work, and Sorlot was given a hefty fine of 80,000 francs (the equivalent of approximately US$250,000 today). Today, in France – as in most democratic countries – there’s a general consensus that “Mein Kampf” should be republished because it’s an important historical document and to demystify it. It’s also already widely available on the web, often on dubious sites that don’t offer context. A critical edition in French is in the works and will almost certainly be published by the end of the year by Fayard, the original publisher of the radically edited “My Doctrine.” This time, the publishing house will set the record straight: rather than massage the language and condense the text, it will take pains to explain and contextualize much of the “Nazi Bible’s” racist, anti-Semitic ideology – and its devastating consequences.